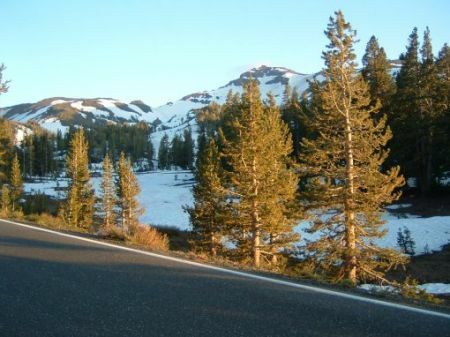 During a visit to the cabin during July 2005, we – Pat, Sean and Chris – decided to take a long day trip over the Sonora Pass and to Tuolumne Meadows. If you browse through the photos below, you can see there was quite a bit of snow covering the mountains around the pass and up to the roadway. We made good time and soon were climbing up Tioga Road (Hwy 120) in Lee Vining Canyon. By the way, at the base of the road there is new Mobil station with a restaurant – pretty convenient though it is quite expensive. It was a nice drive, though, as very few people seemed to be in this neck of the woods. For those who are observant, you’ll see a one or two pictures the gathering clouds of an afternoon thunderstorm. The water was high everywhere through the canyon and Tuolumne Meadows. It was quite amazing. Even the various agencies (National Forest, National Park Service and state park system) had posted temporary signs warning of high water and the possibility of hikers having to cross swollen streams. Exactly three hours later, we arrived at the Tioga Pass Entrance Station. The sky was clear, snow was all around and the water was high. I had forgotten how beautiful it was. The pass only opened on June 24, a tad bit more than two weeks prior to our visit and the campground would not open for another two days. 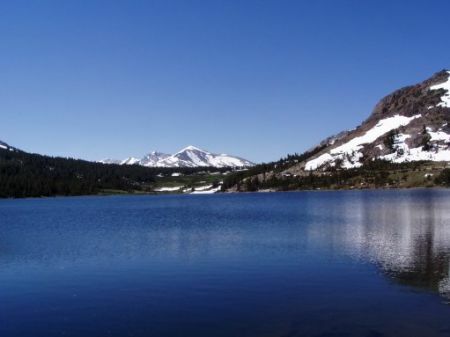 One of our first stops was Tioga Lake. While we were there, two fly fisherman were floating on tubes, with their legs in the very cold water. During our stop, Sean just had to assemble a snowball – a bit of a novelty in July. The snow was different from what one might be accustomed to seeing as there was no human activity interfering with its melting…at least until we arrived! Striking a pose similar to one in a photo of my sister and brother and I with a stringer, probably in the mid 1970s. 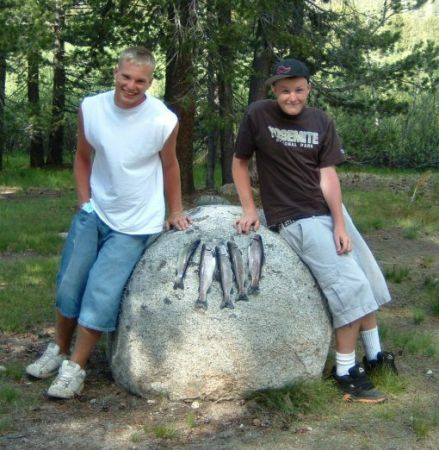 And for my immediate family members…does this picture of the boys with the stringer of fish look familiar? It was taken near one of the campsites at which we stayed. 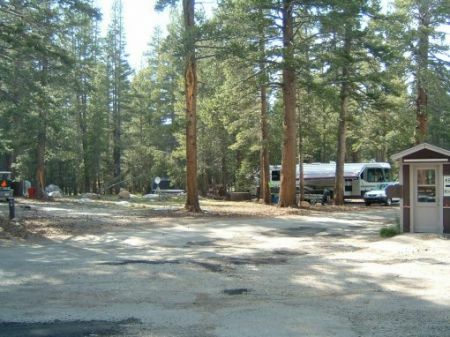 Sure, it has asphalt laid down in the parking spot now and the koisk has been moved, but the Tuolumne Meadows campground is much the same.But out trip was about fishing. We started fishing the Tuolumne River, just outside the campground, but didn’t have any luck. 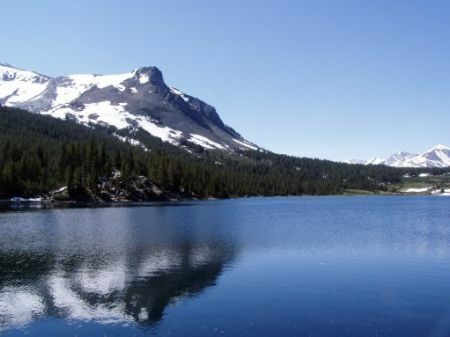 Next, we tried Tioga Lake, where Sean and Chris had a few strikes and saw a few trout follow lures in, but no bites. Then we stopped at Ellery Lake, where Chris pulled in a few trout. Sean also had a few hits, but dad was skunked. I think the whole day was made worthwhile for Sean (and me) at Lee Vining Creek. 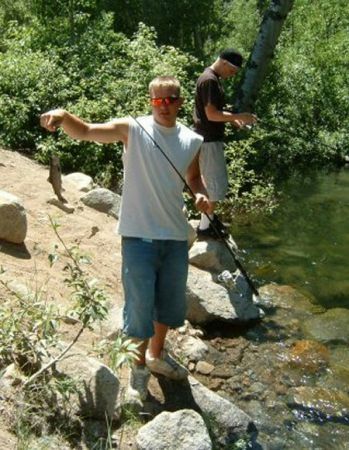 During all of our visits to the streams of the Sierra, the trout seemed to know Sean was coming. But Chris, during a previous visit to the Lee Vining Canyon with Boy Scouts, directed us to this little bend in the Lee Vining Creek – which is more of a small river. Sure, they were prob’ly hatchery trout, but they sure were fun to catch. Near as we can recall, without “fisherman’s exaggeration” creeping in, Sean pulled in about six fish, Pat about ten and Chris maybe a dozen or so. Five are in the freezer awaiting their fate. The nice thing about this jaunt is that we weren’t in a hurry. We took our time on the return leg, driving through June Lake Loop about five-ish and finally reaching Bridgeport close to six. After gobbling down some grub at the ‘Jolly Cone’ we then headed up the road, passing the Marine Corps’ Mountain Warfare Training Center. Along the way we stopped to take in a few vistas – the slowness forced by the twists and turns of the road force one to take in the beauty along the way. 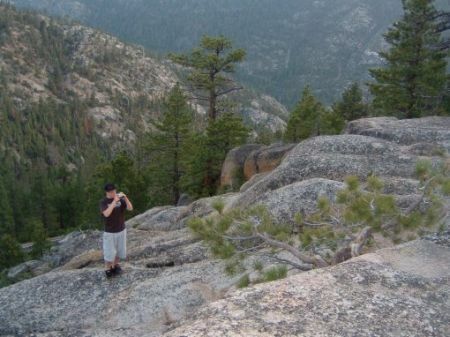 After cresting Sonora Pass, Chris wanted to use his new camera, so we stopped at the East Flange Pass overlook. (Apparently, this pass used as a landmark by the pioneers and Forty-Niners as they descended from Sonora Pass.) 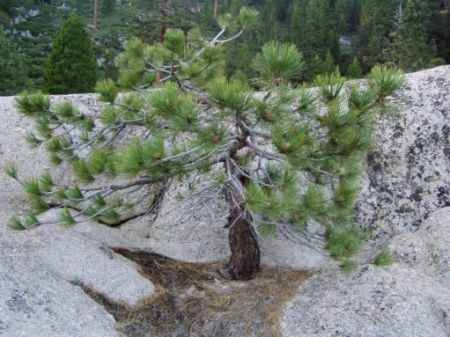 Chris jumped out, scrambled around the granite formation and found a small tree for his subject. 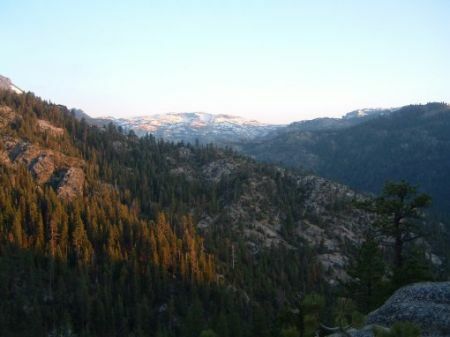 The photo in the album is looking towards the southern Sierra Nevadas and Yosemite. Our last stop was at the Dardanelles Reservoir, about thirty miles from Twain Harte and viewed from a fantastic overlook. We arrived about 8:30 p.m., just as the sun was setting. From the overlook one peers down into a deep canyon at the reservoir, which I have read has little accessibility because of the steep canyon walls, but does harbor some trout. I hope to return during daylight hours as one is offered a tremendous view up and down the canyon and to the mountains north. About forty minutes later we were ‘home’ at the cabin, just in time to wash the smell of fish from our bodies (I even had fish stuff on my shirt). Yeah, it was a long trip but a great trip that I would gladly undertake again. 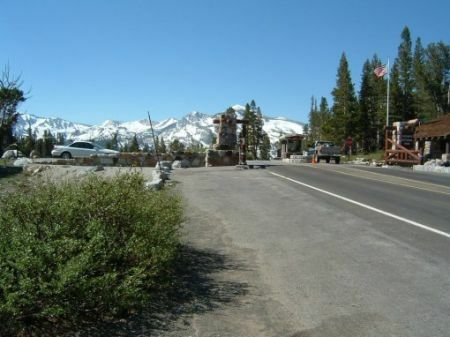 The Tioga Pass Entrance station. There will always be much debate, but I believe this is the campsite we (Luci, Mark and I) visited as kids. We were a bit surprised at the amount of snow, even at the higher elevations. We found some trout in Lower Lee Vining Creek, near the powerhouse. Chris with a fish out of Ellery Lake. 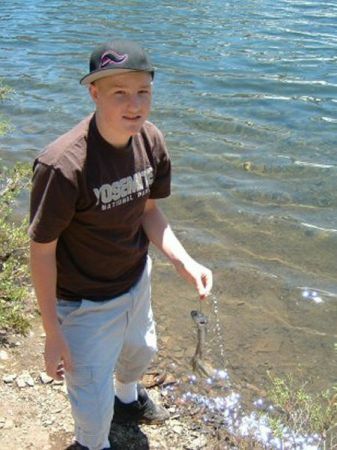 He was the only one lucky enough to catch fish there. 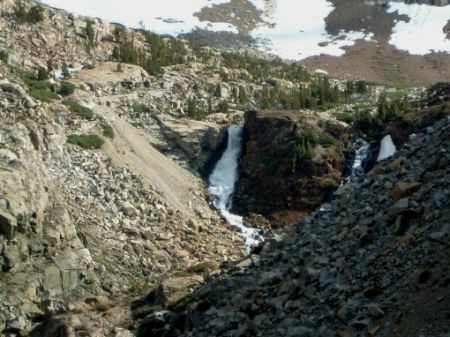 A waterfall near the top of Sonora Pass. Sunset from the East Flange Pass Overlook. Chris working his photography skills.